Dec. 27, 2017: International Space Station Configuration. 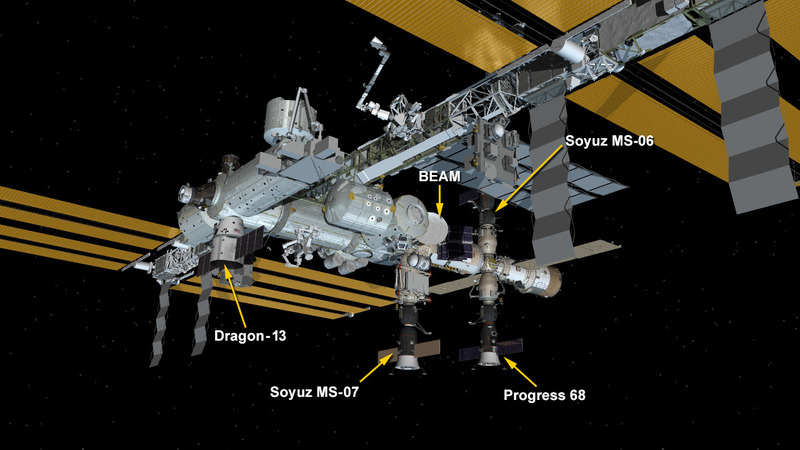 Four spaceships are parked at the space station including the SpaceX Dragon space freighter, the Progress 68 resupply ship and the Soyuz MS-06 and MS-07 crew ships. Filled with trash, the unpiloted ISS Progress 67 Russian cargo ship undocked from the aft port of the Zvezda Service Module of the International Space Station at 8:03 p.m. EST. Just after 11 p.m., Russian flight controllers will send commands to fire the Progress’ engines and deorbit the space freighter, sending it to a destructive entry over the unpopulated south Pacific Ocean. For more information about the current crew and the International Space Station, visit: http://www.nasa.gov/station.